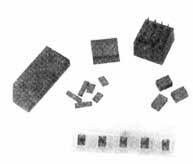 Ferrite NiZn F cores, SH cores, SR cores, SMB cores have a paramount advantage over other types of magnetic materials: high electrical resistively and resultant low eddy current losses over a wide frequency range. Additional Ferrite NiZn F cores, SH cores, SR cores, SMB cores characteristics such as high permeability and time/temperature stability, Low cost, large selection of materials, shape versatility, economical assembly, temperature and time stability, high resistibility, wide frequency range (10KHz to 50 MHz). Ferrite NiZn F cores, SH cores, SR cores, SMB cores have expanded ferrite uses into transducer-core, quality filter circuits, high frequency transformers, wide band transformers, adjustable inductors, delay lines, and other high frequency electronic circuitry.